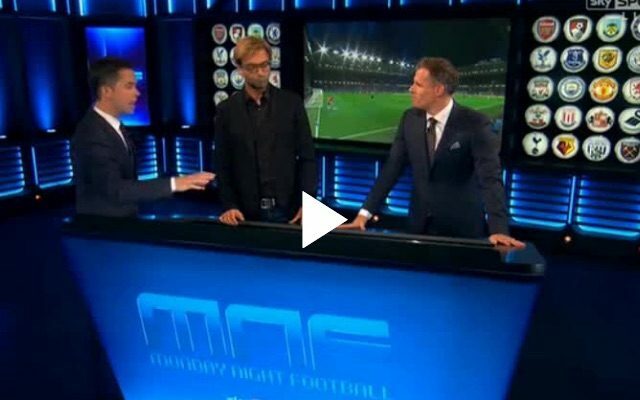 We’re sure many of you were lucky enough to catch Jurgen Klopp’s hour on Sky Sports last night where he spoke fantastically alongside Jamie Carragher for Monday Night Football. One section we particularly enjoyed was when Liverpool’s manger was asked about why he plays one up front, but he rejected this question as unimportant – instead using the high-tech screen in front of him to show that providing a certain player is occupying a certain part of the pitch – the actual ‘position’ isn’t important. The presenter tries to get a soundbite out of Klopp, prodding him to suggest he uses a ‘3-7’ formation in possession, but Klopp’s having none of it; describing how his team are just ‘wild-boys’ with and without the ball.